This 16 Channel 5V Relay Module SPDT (Single Pole Double Throw), can be use to control devices which uses a higher voltage than what most micro-controllers such as an Arduino or Raspberry Pi can handle. This particular relay module can control typical household appliance up to 10A. Note: PCB color, or layout may vary slightly. 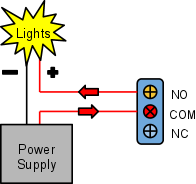 Relays work on electromagnetism, When the Relay coil is energized it acts like a magnet and changes the position of a switch. The circuit which powers the coil is completely isolated from the part which switches ON/OFF, This provides electrical isolation. This is the reason we can control a relay using 5V’s from an arduino and the other end of it could be running an 220 to 240V appliance, the 240V end is completely isolated from the 5V arduino circuitry.